Margaret Willingham with "Red & White Explosion". Come see wonderful crafts and quilts and support the Parish House Museum! The 16th Annual Stitches in Time Fall & Holiday Quilt and Craft Show will be held at Roosevelt High School, Johnstown, CO, October 21, 2017. Margaret Willingham, the founder and creative force of Eye of the Beholder Quilt Designs, will give a lecture and trunk show, "Quilting! A Creative Journey", from 11:00 am - Noon in the auditorium. Get a glimpse of her creative journey from choreographer to quilter and see her unique, original quilts. Her specialty is reverse applique by hand and machine with a method she created that makes it easier and fun! Be inspired! Sharon Engel with her one of her prize winning quilts. Experience the quilt artistry of featured quilter Sharon Engel. Sharon is a very talented quilter, a lovely lady and friend. Marvel at the beauty of her award-winning quilts. Plus, enjoy the many quilts of Johnstown area quilters. They are sure to please the eye and inspire you to quilt. 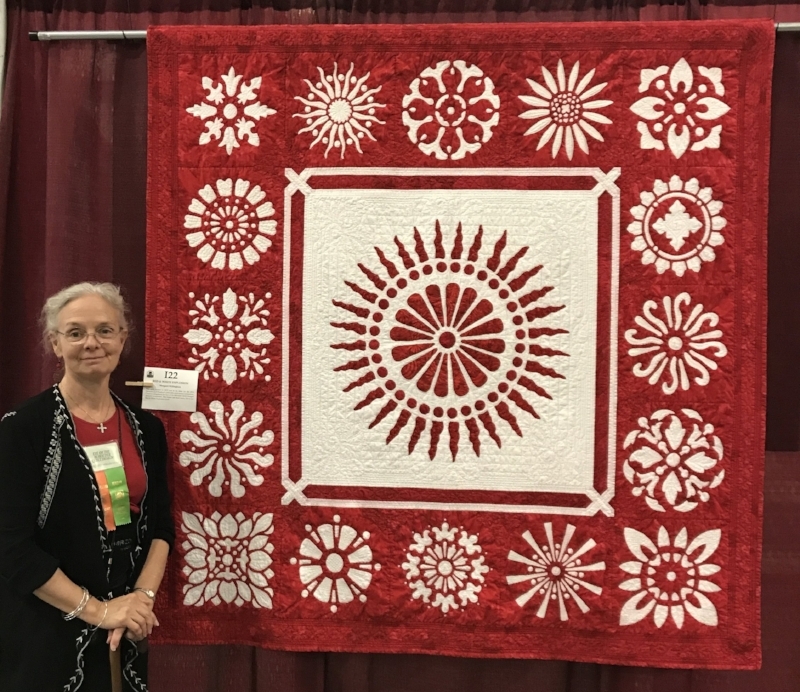 When not lecturing, Margaret will be set up in the quilt room giving non-stop DEMOS of her easier methods for hand and machine reverse applique. Her patterns and other useful products will be available for sale. Once you see how fun and easy her technique is, you too could make your own reverse applique quilt pieces using Eye of the Beholder's unique patterns. The "Stitches in Time" Fall & Holiday Quilt and Craft Show is a great opportunity to begin your Christmas shopping.